Elegance. Style. Excellence in every detail. 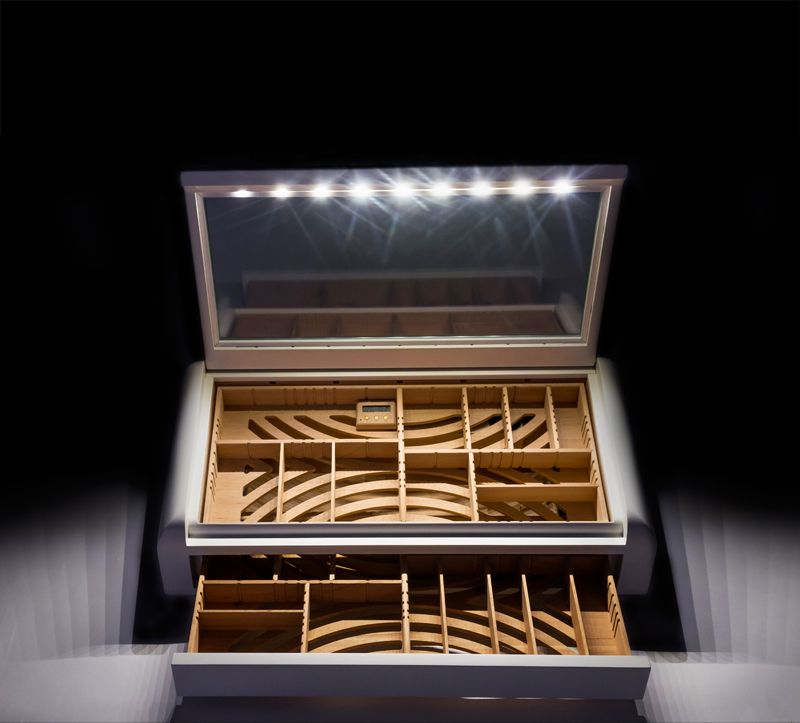 The newest model of luxury humidors, like all other Maklary Humidors, is the fruit of years of hard work and perfection of the designer Zoltan Maklary. Vertigo, besides the extraordinary first impression it creates, is unique in terms of its specially designed clean lines and smooth curves, technical virtuosity, and the most advanced technological solutions. 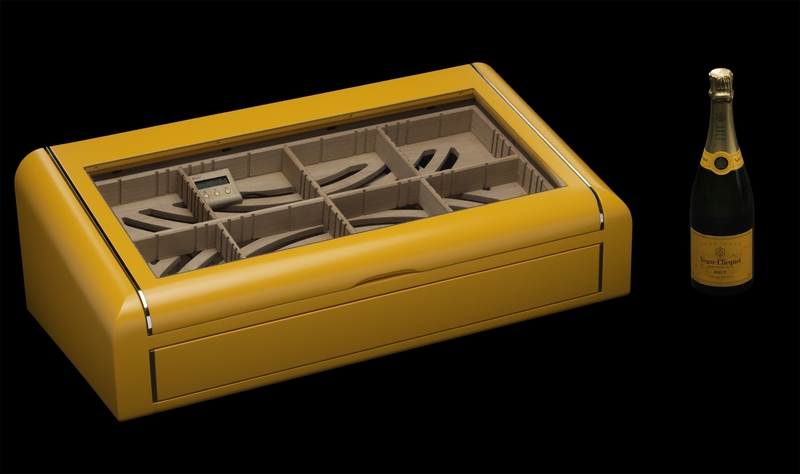 Similar to all humidors of the Maklary brand, the product is made entirely of premium quality solid wood.The unique structural design made it possible to locate the entire electronic system in the hidden side and rear chambers of the frame construction, hence leaving the two batteries, the chargers, air ducts and cables invisible. 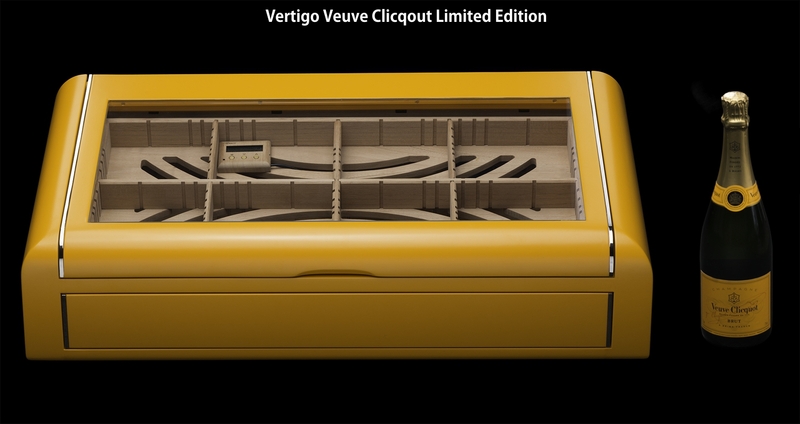 Due to its dimensions of 80 x 38 x 15-25 cm, Vertigo is definitely unrivalled in the world of luxury humidors. 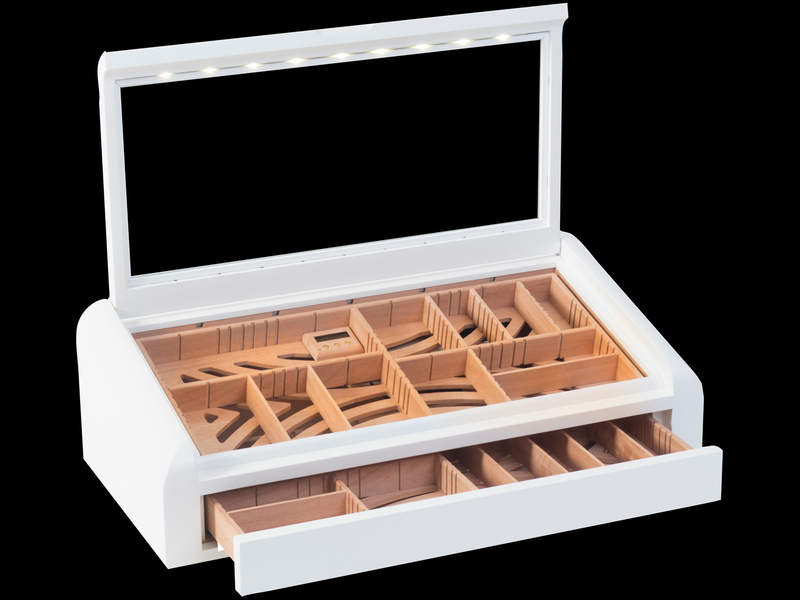 As part of the modern design, the sophisticated structure of the lid hides a number of technical elements, such as the innovative illumination system, cables, custom engineered hinges and an opening sensor. 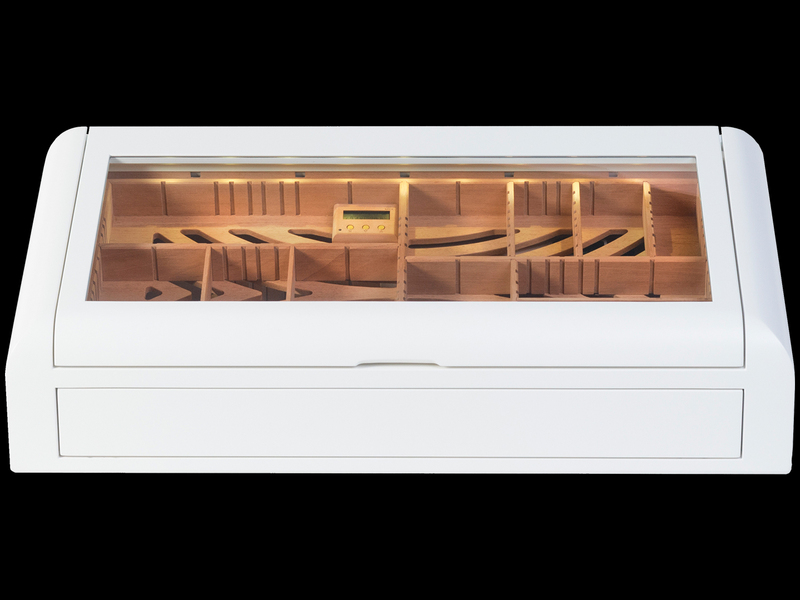 Another part of this modern design is the 100% UV-safe, 8mm thick safety glass which lies perfectly in plane with the wooden frame, leaving nothing but an elegant finish behind. 18 Japanese leds installed into the own wood channels of both longitudinal roof sides provide floodlight. The leds grant 100 hours of illumination with maximum brightness due to the large 23.5 Ah Li-Ion battery specifically developed for this purpose. In case of illumination at night, brightness set at half level also provides sufficient illumination, but this way the operating time is nearly 300 hours. 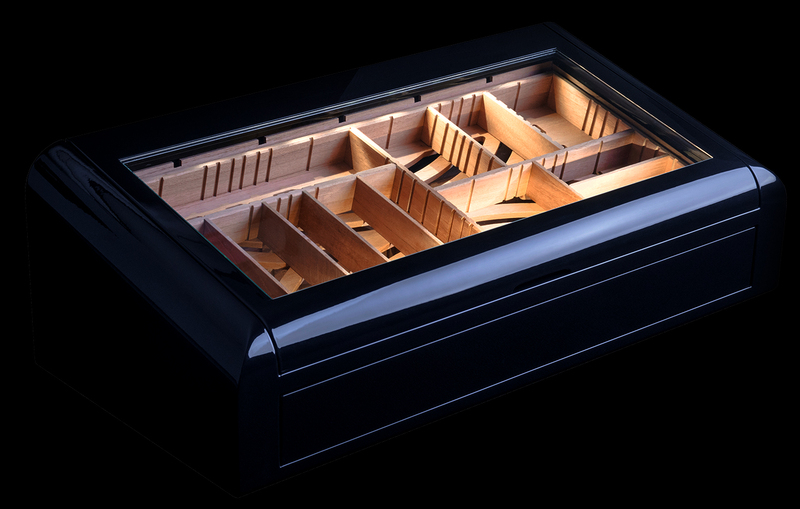 The brightness and switching of led can be controlled with the two buttons placed outside the humidor on its backside. The light beams of the two led lines are controlled by using covering strips, in order to provide illumination only for the relevant interior space. 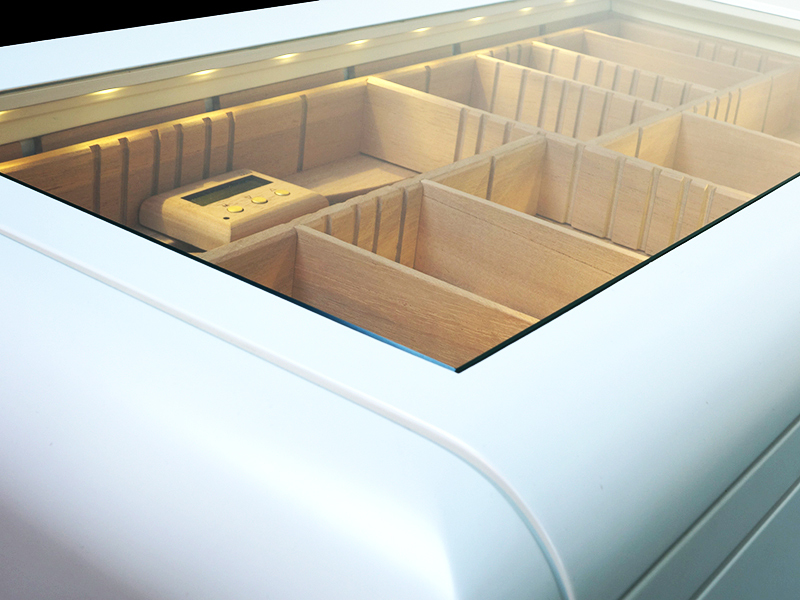 When opening the roof a further hidden sensor switches off the lower led line temporarily to prevent glare, whilst the upper one also provides full illumination to the open drawer. The digital humidifier exclusively designed and manufactured for Vertigo runs on battery power in line with the water capacity for 3-4 months on a single charge. The material of the humidifier is top-quality aluminum-magnesium alloy and its color is harmonised with that of the Spanish cedar interior. The device has to be inserted between the two trays, into the air duct that can be found hidden in the rear wall of the humidor. The humid air that is blown straight to the air duct reaches both trays evenly, exactly at 5-5 points each. 3 dl of water is stored in the form of special acrylic-polymer gel bags within the humidifier machine. 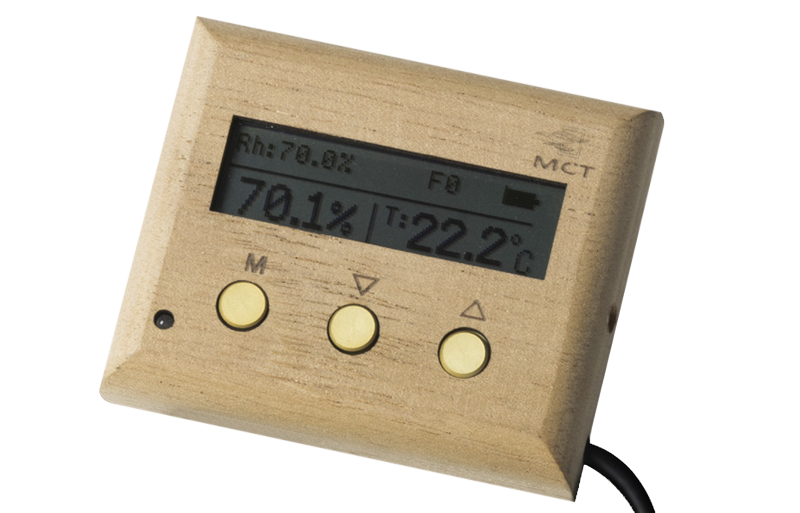 The controller of MCT Humidifiers is equipped with a Precision Swiss sensor, LCD display and smart electronics and comes in a solid Spanish cedar case. It can be deliberately placed anywhere in the humidifier as it automatically flashes and signals if necessary. 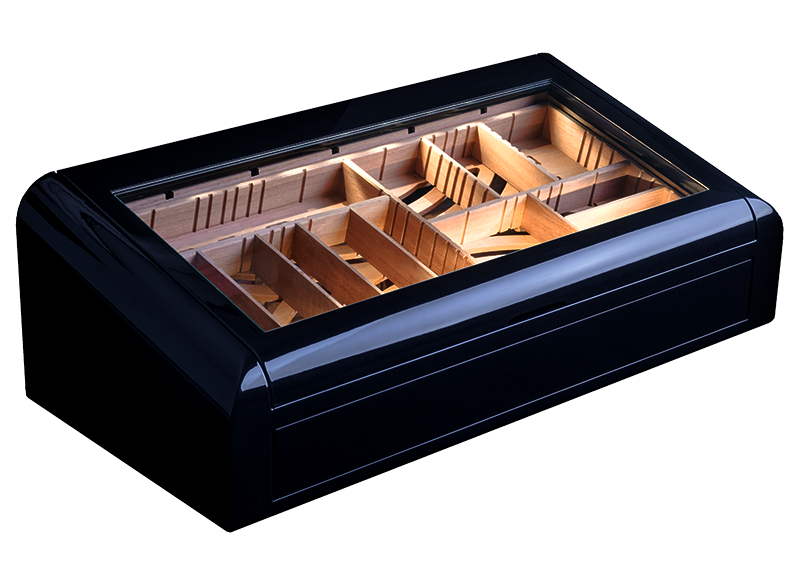 Due the unconventional dimensions of the humidor, we devoted special attention to its exterior design. Thanks to the special opening mechanism, the glass lid never leans behind the back of the humidor so you can place it as close as 1 cm directly against any wall or object. This yields 5 cm extra space for the cigars, compared to any other humidor. The lid weighs 8 kg, which, due to the weight relief mechanism integrated into the hinges, is reduced by 90%. It can proudly be regarded as a highly innovative, already patent-pending Maklary technology. 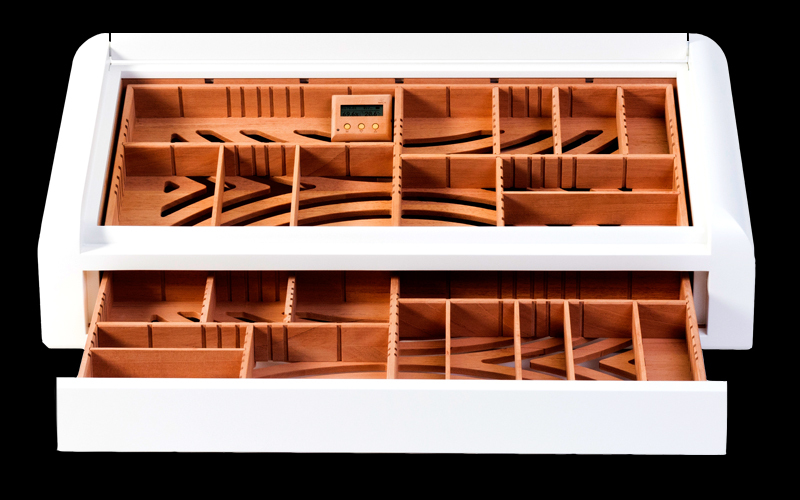 The trays, in line with the interior of Vertigo, are made of solid Spanish cedar wood. 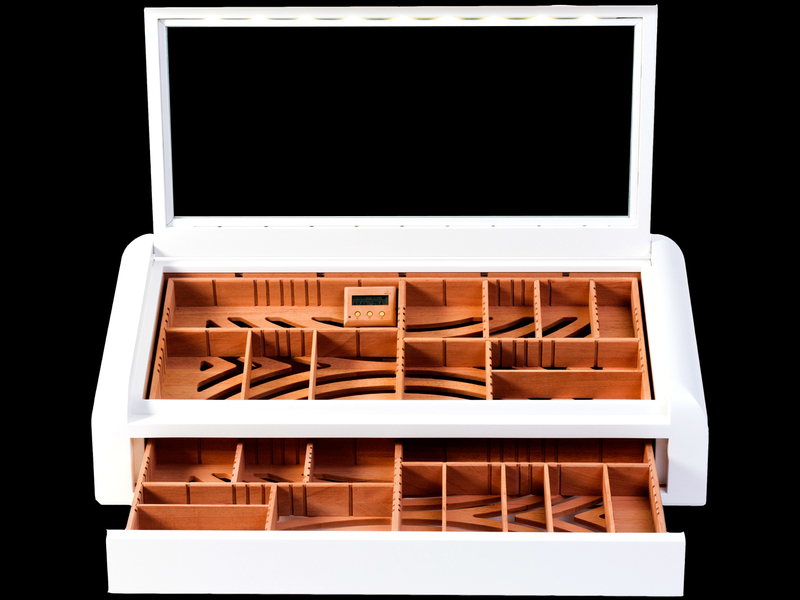 The division of the trays can be freely varied based upon the cigar sizes and the inner height even allows for the storage of entire cigar boxes. 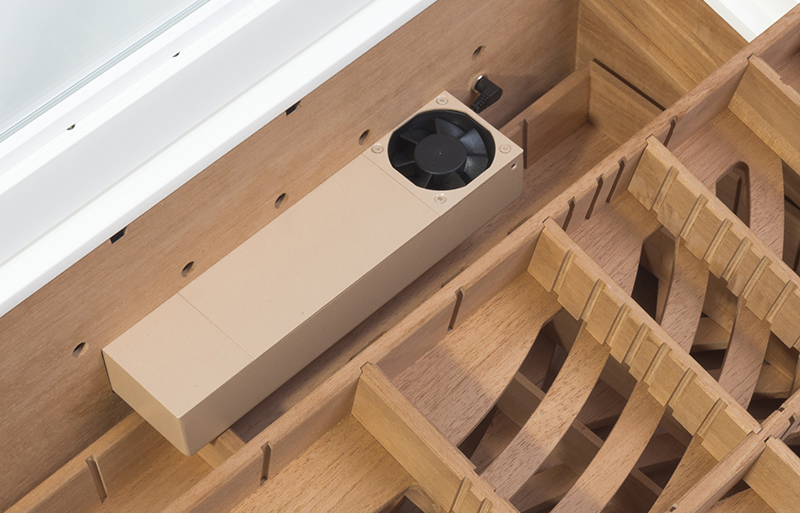 The bottom tray serves as a hidden drawer that opens in response to a slight push; its content is only visible in the open position. The two trays altogether provide storage for approximately 400 cigars. 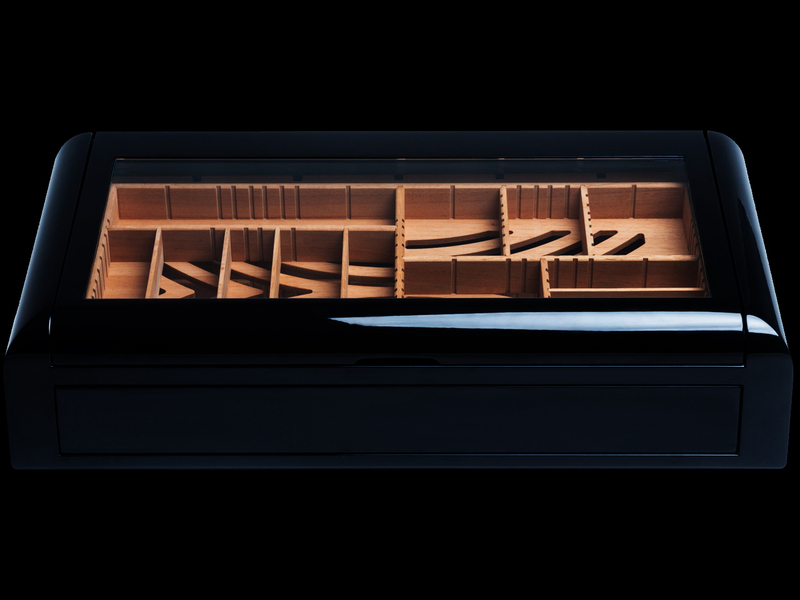 Yet, due to its extraordinary design, with only 50 placed in the upper tray it is still an impressive visual experience.